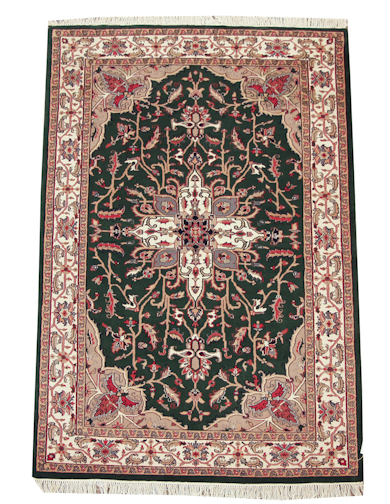 Green Indo Serapi hand knotted with wool pile and cotton foundation. This is a very elegant Indian interpretation of an antique Serapi design featuring an unusual emerald green field. Measuring approximately 6′ x 9′, the rug featured today is slightly larger than your average 5’3″ x 7’10″ machine made area rug. Also putting into perspective a comparative machine made carpet to this hand knotted rug would be to consider the Karastan 700 Series as an alternative. With a list price of nearly $2000 for a 6′x9′ Karastan machine made (Lucky to find one at under $800), why would this $700 (shipped within the US!) 6′x9′ hand knotted Oriental rug not be a preference? 6′x9′ Dark Blue Hand knotted rug from China, approximately 10 years old, never used. Dark blue field in Persian Design. One small area of repair toward the fringe. Approximate knot count in the vicinity of 130 KPSI. Click on image for more details, photographs and information.